Find hotel near Hash Marihuana & Hemp Mus .. Located in the De Wallen area of Amsterdam, this is a way to see two museums and pay for just one. Though both are smaller, they lie in a close distance to each other and offer varied insights about the hemp plant, also called cannabis. We all know about the medicinal, spiritual and cultural significance of cannabis in the modern and old world, but to know more about it, one may visit this museum that has been in the scene since 1985. The first one covers its usage, enlightening us on its history considering it is one of the first crops to be introduced to mankind. The other one tells us how it was used to prepare ropes and oils and such. Both museums showcases its evolution from the basic commodity to today’s more modern approach. Take traditional art for example! In all we would say that while you may not want to bring your children here but the place is fun nonetheless. Professional photography and filming must be arranged in advance. Groups of 10 persons or more receive a discount of 20 %, if paid full. 5 % discount on online purchase of tickets. 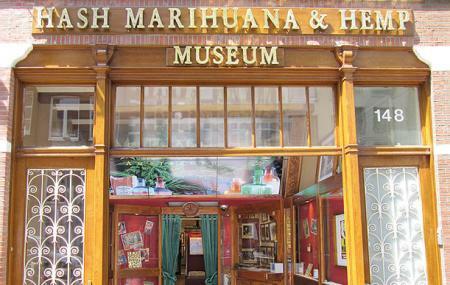 How popular is Hash Marihuana & Hemp Museum? People normally club together Cannabis College and Sherlocked - Mystery Experiences while planning their visit to Hash Marihuana & Hemp Museum. Great place, lots of great information and pictures. Loved the live grow. Didn't use the handheld information device much but was a nice touch if we'd have had more time. Staff were friendly and fun people. Wouldn't go again just us because wasn't huge so feel I have seen it now but was a great experience and we feel happy to have gone, would probably take friends/family and highly recommend to everyone. This museum is a fantastic way to learn about the cannabis plant. The displays are well throughout and informitive. The tickets to the experience include a two part tour through cannabis history and manufacturing. While the whole experience only takes an hour and a half, it's a entertaining peak into cannabis culture! Extremely instructive museum. There are audio-guides in different languages. We've learned a lot about marijuana, the history of hemp and the use of it. Really loved the "We Are Mary Jane" exhibition. Worth our money ! Very interesting experience. Do you want to know everything about this harmless but controverse substance? Check it out!